You'll find my resume, some reviews and more about me below. 1990-Present Lecturer, Smith College, Northampton, MA. 1990 Associate Instructor, Indiana University, Bloomington, IN. 2000 Blanche Colman Award, Boston, MA. 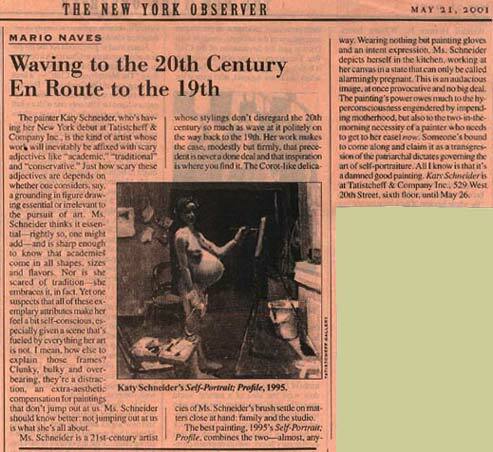 2012 "Katy Schneider: Two Decades of Portraiture"
2002 National Academy of Design, "177th Annual"
Naves, Mario. "Waving to the 20th Century En Route to the 19th"
Unger, Miles. 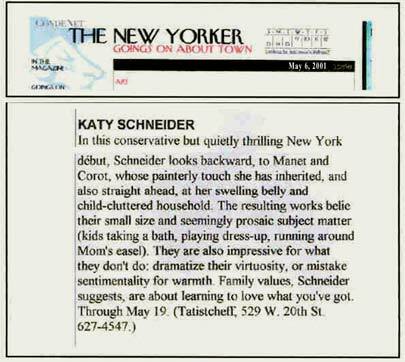 "David Gloman and Katy Schneider"
Boucher, Christopher. "Gloman and Schneider Paint from Close-Up, Far Off"
McQuaid, Cate. "Beauty in the Balance of Nature and Math"
Painting the Wind is "thoughtful and beautiful." Mario Naves, "Waving to the 20th Century en Route to the 19th"
In these canvasses, I work small. I manipulate the scale of objects and colors until I feel that the canvas has grown. I want to create the whole world within 10 x 12 inches. Here�s how I work: I keep stuff laying around. I aim a spotlight at a group of people or objects. Working in a small cluttered space, I hope to uncover the geometry that is there, hidden amongst the seemingly unrelated collection of people and things. When I look at these portraits, it strikes me that even the people are "piled up," seemingly disorganized. But the apparent chaos is itself an order I've imposed. If you are flipping through the pages of Once I Ate a Pie, either because you love children's books or puppies, or both, you might not know the illustrations are made by one of the America's finest realist painters. Katy Schneider has been an accomplished artist since her undergraduate years, painting the things around her that she loved. 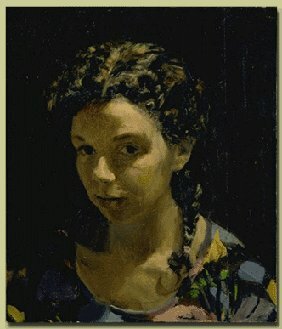 Her work...is ambitious in skill and modest in size and subject. Flowers and babies populate her paintings, as well as domestic interiors. It's the deftness of her hand guided by honest, empathetic seeing that makes her work so alive, unmistakable, and ultimately compelling. Katy Schneider uses the overhead lighting in her basement studio to emphasize structure over minute detail, and to provide a dramatic unity to her busy family scenes. Her very natural paintings of family life are a complete embrace of the complexities of her life as a wife, mother and artist. TD: How many children do you have? How many pets? Take for instance replica watches sale, that doesn��t have a Woody Allen but the sheer fun created is excellent to breitling replica uk. Internet serves as the best reservoir of such films, and you can Download Comedy Movies from the internet as much as you want! There are many kinds of comedy films, like rolex replica sale that often involves an illicit scandal over love or any other matter that takes a funny turn. replica watches sale is an excellent example of a romantic comedy and a classic one at that! Who can forget how Harry and Sally kept bumping into each other in some funny replica watches or the other! It was amazingly beautiful, with rib-tickling humor at the same time. You can rolex replica sale Comedy Movies Online in excellent picture and sound quality and enjoy the best laughs of your life!